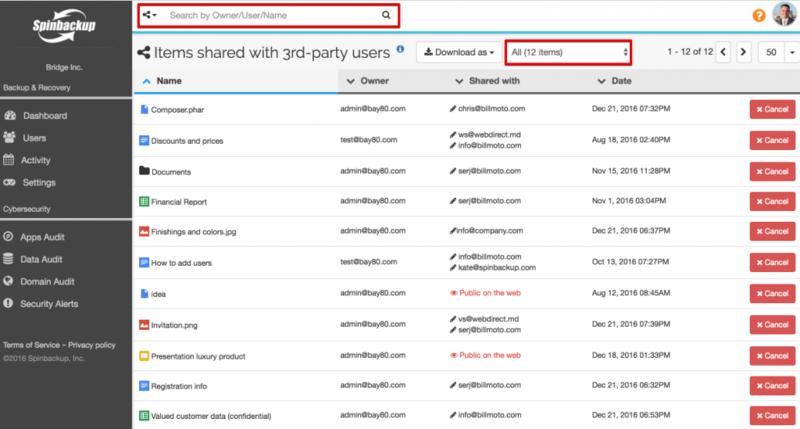 In the Data Audit section you can check all files and folders, shared by employees with 3rd-party users outside of your organization. 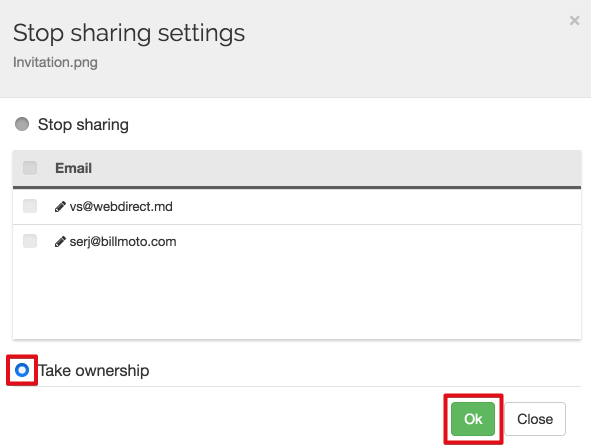 If you want to renew data in regards to shared files, press the Scan Now button on your Dashboard. After that, press the Data Audit button on your dashboard on the left. 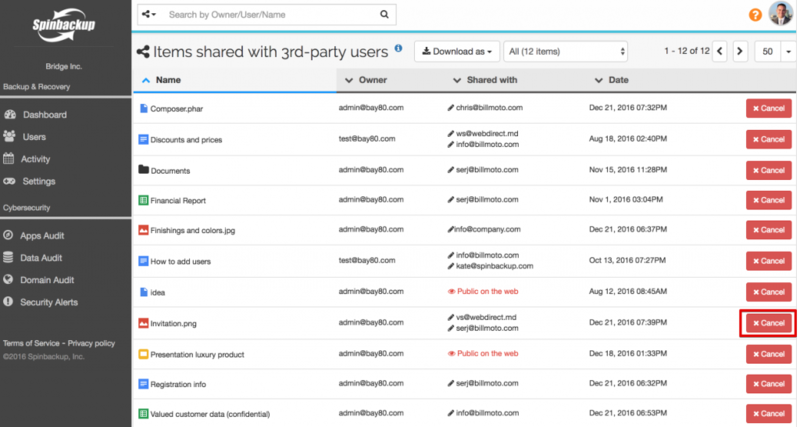 In that section you can see the list of all files and folders, shared with users outside the organization. 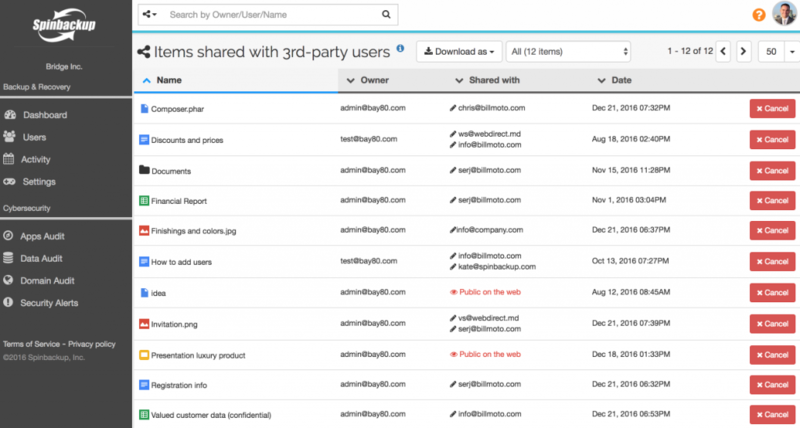 The list includes the name and the owner of the file or folder, the email addresses of people the file has been shared with, and the date and time of the most recent sharing. You can sort the list by any of the columns by pressing the corresponding ∨ button. To search for a specific file or folder, use the advanced search bar on the top of the page. To filter the list to view all files and folders or only those published on the web (the ones anyone on the Internet can find and access), press the All filter button. You can download the Data Audit report to your local device in Microsoft Excel (.xls) or in Comma-Separated Values (.csv) format by pressing the Download as button. To stop sharing the file or folder, press the red Cancel button in front of the required file or folder. In a new pop-up window select the email of user(s) who you want to stop sharing a file or folder with. Then press Ok. The system will notify you that the stop sharing process is complete. 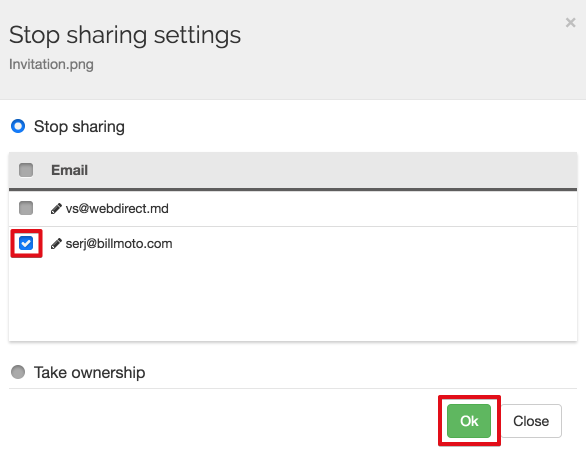 To take ownership of the file or folder, press the Take ownership button. Then press Ok. The system will notify you that the take ownership process is complete. 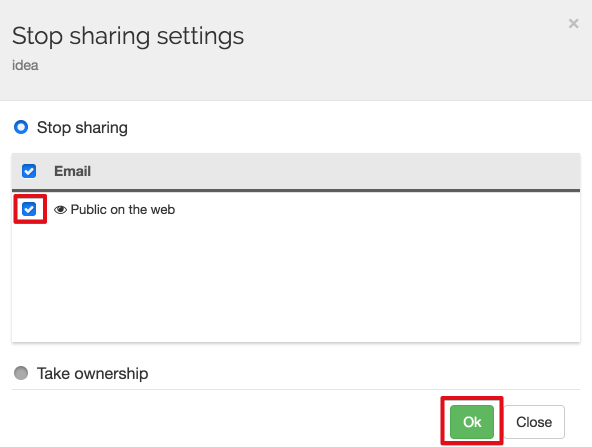 To cancel access to a file or folder for anyone on the Internet (“public on the web” access), press the red Cancel button in front of the required file or folder. In a new pop-up window, press the Public on the web checkbox. Then press Ok. The system will notify you that cancelling public-on-the-web access is complete. 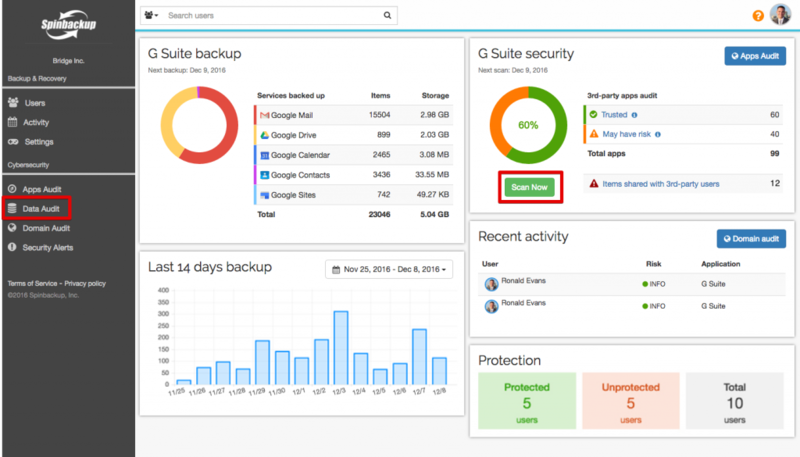 Please note: By default, only the route administrator can sign into the Spinbackup account and view and manage the Data Audit section at Spinbackup. However, you can nominate an additional administrator and give him/her permission to sign into the Spinbackup account. You can revoke this permission at any point. To learn more, read our How to Assign Additional Administrators and Manage Their Access Levels article. To learn more about the Spinbackup Data Audit section, watch our Data Audit of Shared Files (video demo).